Fantastic table set ups in the garden. I’m sure you can’t hardly get out in you garden of yours. So serene and pretty! Who wouldn’t want to sit down for a glass of lemonade at that setting? Just beautiful! Looks like such a happy place to be! Just lovely. Thanks for sharing!! What a Happy place to be…seems so nice and relaxing! thanks for sharing!! I love your setting. It is so inviting and very creative. Thanks for sharing. What a wonderful blog site you have. I wish I could sit and enjoy the lemonade. The first thing that caught my eye was your lovely tablecloth – so pretty and perfect in a garden. Your lemonade looks delicious and so elegant! Your garden setting is just beautiful, thanks for sharing! Just lovely. I am doing mostly containers this year as well. I have a nice chair and will have either lemonade or iced tea and spend a lot of time looking at the flowers. Love your gardening table setting. Okay, when can I come over?!?!?! so lovely – wish I could drop in for a bit of lemon aide! Fantastic tablescape… lemonaid, cookies and garden books are a perfect way to spend the day! So pretty! Looks like you are ready for spring and summer. What a neat place to take five from gardening…lemonade is my favorite summer drink. That is very lovely. What a nice way to relax from gardening. Yes indeed, what a wonderful place to sip some lemonade amongst the gardening chores. Cozy and gorgeous. Christi, absolutely a great place to take a break! Very cute and a little humorous! Very relaxing, very springy! What a great spot to just hang out and read. Very lovely. so fresh and sweet, i love garden parties! What a sweet spot to enjoy the garden and have some lemonade! This almost looks like a lovely place to take an afternoon nap! 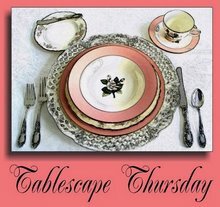 What a fun, creative idea for your tablescape. Those new green garden gloves have gotten me in the mood for planting! Hi, I love your type of “garden work”. That’s a cute place to rest. I would love to sit there and have a glass of lemonade. The robins twitters and the sun shines. Your tablescape makes me smile. Very cute. I love the juxtaposition of your gardening tools with the delicate table cloth! Wish I could page through those gardening books, too!